Europe is clearly going through a financial crisis, America is changing its decadent ways by being more frugal but Asia is one of the last regions where fortunes can still be made. It's the new mantra for most car manufacturers, especially those in the luxury segment where the total volume of cars, irrespective of brand, is probably lower than the number of people employed all together in that segment of the business. But Asia while highly aspirational isn't brash, it isn't impulsive. Spending big money on big cars that burn more money than fuel isn't the Asian way. It's why most luxury and sports car manufacturers are marginally downsizing their products to make them more affordable to own. Case in point Bentley. From manufacturing colossal 12 cylinder engines to power their range of cars, Bentley has together with Audi developed a smaller all-new engine for the Continental. It's a 4.0-litre V8 and delivers Bentley's promise of making an economically friendlier engine which would be kinder to the environment as well. The engine is fed by two twin scroll turbochargers and direct injection both of which give the engine the same depth and range as the W12 engine. In fact the V8 helps the Continental maintain a similar status quo to the W12 without deducting anything. 2.5 tonnes. That means the V8 has a bit of an uphill struggle to generate the same rapidity and pace as the W12. Bentley's next focus area should be on drastic weight loss, the benefits are obvious and I will come to that in a moment. I don't know how they will achieve this, probably do the zumba, but this car needs to lose some of its chubbiness. Now I'd like to think of this V8 as a marvelous feat of engineering, because consider this - it's just 67PS less powerful than the W12 but it will allow the Continental to accelerate to 100kmph in 4.6seconds, just two tenths of a second slower than the W12. Its top speed is 302kmph as compared to the 318kmph the W12 registers. But it offers 40 per cent better fuel efficiency than the W12 for skeletal performance losses, that is incredible. For a Bentley owner it's of little consequence just how much fuel goes into the car, what matters is the range and a full tank should last around 800km. Which probably means two Mumbai-Pune round trips or three round trips between Delhi and Agra before you need to refuel! So how does a car that does a 100 in 4.6 seconds get to be 40 per cent more efficient. It's actually quite simple, 16 per cent comes from it being a smaller displacement engine. Six per cent comes from the 8-speed transmission and another five per cent comes from variable cylinder management. What that means is that when driven sedately only four of the eight cylinders are used for combustion. Now four cylinders are enough to get this car from point to point if the situation isn't urgent. But if it is, all you need to do is prod the gas pedal harder to get the juices flowing through all eight cylinders. Some more benefits are added on by components such as the power steering with variable ratio, indirect high efficiency intercooler, direct injection technology, better aerodynamics, improved alternator management and improved oil circulation in the gearbox to cool it efficiently. Curiously the Continental V8's transmission isn't a DSG and though that twin clutch box would have been lighter, quicker and probably more efficient, Bentley claims to have matched the shift times with a standard torque converter and yet get the desired fuel efficiency. So what's the car to drive like then? At the Navarra circuit near Logrono in Spain, the V8 feels fast. Put that down to the incredibly well spread torque. The engine responds beautifully and on the main straight that is less than a kilometre long it wasn't too hard to see the car touch close to 220kmph. But it's not just the engine, downsizing has also helped improve the dynamics. Now I won't say that this car is anywhere in the league of the Ferraris and Lamborghinis but yes taking 25kg off the front axle has given it a bit more poise and agility. And yet if there is one thing I have learned from the hour spent hammering the Continental V8 around the Navarra circuit it's that to make this car go fast you have to know how to drive it slow. By slow I mean that corners have to be taken without over cooking the throttle. There is a fair amount of understeer if you enter a corner too hot and even though the massive 16-inch carbon ceramic brakes on the front wheels help shed most of that speed rapidly the momentum generated by 2.5 tonnes isn't easy to stabilise. Having a 4WD drivetrain helps, but it's more beneficial to getting more power on the ground and thus higher speeds out of the corner rather than trying to manage the car through the corner. And the tidal wave of torque is enough to propel this car into triple digit speeds instantly. There is an immense amount of pleasure to be derived from this car but it has got everything to do with how you use your tool rather than the size of it. The adaptive suspension does help in keeping dynamic matters in perspective but with 49 per cent weight biased towards the rear, which is nearly 1.2 tonnes, it's hard for the suspension to hold on to that perspective for long. Can you run it into oversteer, yes you can in which case it's a lot more sideways but never fun. Now Bentley also claims that they have engineered the car to sound better but it lacks the clarity of a Maserati and the venom of a Lamborghini. In all fairness it's a sports car like growl and on a race track it does sound loud, but clearly it's a sound of a car being asked to sing a tune it pretty much does not want to. Even on a Continental GTC V8 with a soft top roof the exhaust lacked the intensity to stir anything within me. Nonetheless the Continental V8 is destined for much success. It does look nicer than the W12 on the outside principally the twin strakes on the lower bumper that make it more aggressive. It has also got sleeker interiors and is perfect as an everyday car with comfortable seats and plush leather and wood veneers. I quite liked driving it not as much on the circuit as much as cruising around the Iberian countryside, letting the Naim-for-Bentley audio system thump to a hip hop beat and letting just four cylinders comfortably do their thing. Who ever said a Bentley needed eight? 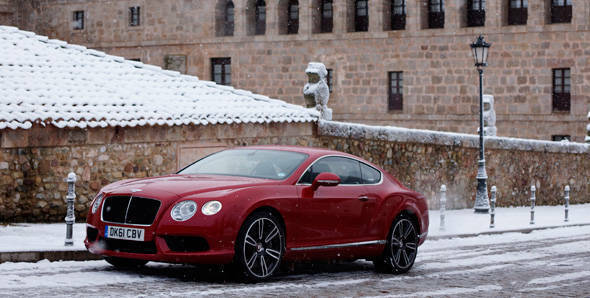 Bentley also claims that the Continental GT V8 is going to be priced around 10 per cent cheaper than the 12-cylinder version. It may not seem like much and by the time the car lands on our shores that 10 per cent may not amount to anything at all. In Europe the fuel savings and ownership experience may benefit from the V8 since these cars are driven around frequently but in India where snob value is dictated by the size of your equipment, the V8 may just not find the right audience. Probably a fast diesel next Bentley?